Contents: Vegetable soup, mashed potatoes, roasted fish, vegetables and spices, and lettuce. Notes: Those mashed potatoes are strange looking. The soup looks awesome, so does the fish. Oh, they tend to do something decorative with the mashed potatoes and serving spoon when they put them on the plate. 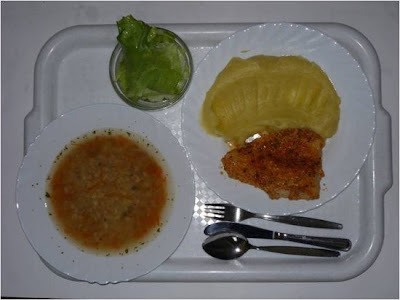 Next time I'm in Slovakia, I'll get a picture of those lunches... they're very similar to the Czech ones.